This is an artist impression of the triple star system PSR J0337+1715, which is located about 4,200 light-years from Earth. This system provides a natural laboratory to test fundamental theories of gravity. This theory has passed test after test here on Earth, but does it still hold true for some of the most massive and dense objects in the known universe, an aspect of nature known as the Strong Equivalence Principle? An international team of astronomers has given this lingering question its most stringent test ever. Their findings, published in the journal Nature, show that Einstein's insights into gravity still hold sway, even in one of the most extreme scenarios the Universe can offer. Take away all air, and a hammer and a feather will fall at the same rate - a concept explored by Galileo in the late 1500s and famously illustrated on the Moon by Apollo 15 astronaut David Scott. Though a bedrock of Newtonian physics, it took Einstein's theory of gravity to express how and why this is so. To date, Einstein's equations have passed all tests, from careful laboratory studies to observations of planets in our solar system. But alternatives to Einstein's general theory of relativity predict that compact objects with extremely strong gravity, like neutron stars, fall a little differently than objects of lesser mass. That difference, these alternate theories predict, would be due to a compact object's so-called gravitational binding energy -- the gravitational energy that holds it together. In 2011, the National Science Foundation's (NSF) Green Bank Telescope (GBT) discovered a natural laboratory to test this theory in extreme conditions: a triple star system called PSR J0337+1715, located about 4,200 light-years from Earth. This system contains a neutron star in a 1.6-day orbit with a white dwarf star, and the pair in a 327-day orbit with another white dwarf further away. "This is a unique star system," said Ryan Lynch of the Green Bank Observatory in West Virginia, and coauthor on the paper. "We don't know of any others quite like it. That makes it a one-of-a-kind laboratory for putting Einstein's theories to the test." Since its discovery, the triple system has been observed regularly by the GBT, the Westerbork Synthesis Radio Telescope in the Netherlands, and the NSF's Arecibo Observatory in Puerto Rico. The GBT has spent more than 400 hours observing this system, taking data and calculating how each object moves in relation to the other. How were these telescopes able to study this system? This particular neutron star is actually a pulsar. Many pulsars rotate with a consistency that rivals some of the most precise atomic clocks on Earth. "As one of the most sensitive radio telescopes in the world, the GBT is primed to pick up these faint pulses of radio waves to study extreme physics," Lynch said. The neutron star in this system pulses (rotates) 366 times per second. "We can account for every single pulse of the neutron star since we began our observations," said Anne Archibald of the University of Amsterdam and the Netherlands Institute for Radio Astronomy and principal author on the paper. "We can tell its location to within a few hundred meters. That is a really precise track of where the neutron star has been and where it is going." 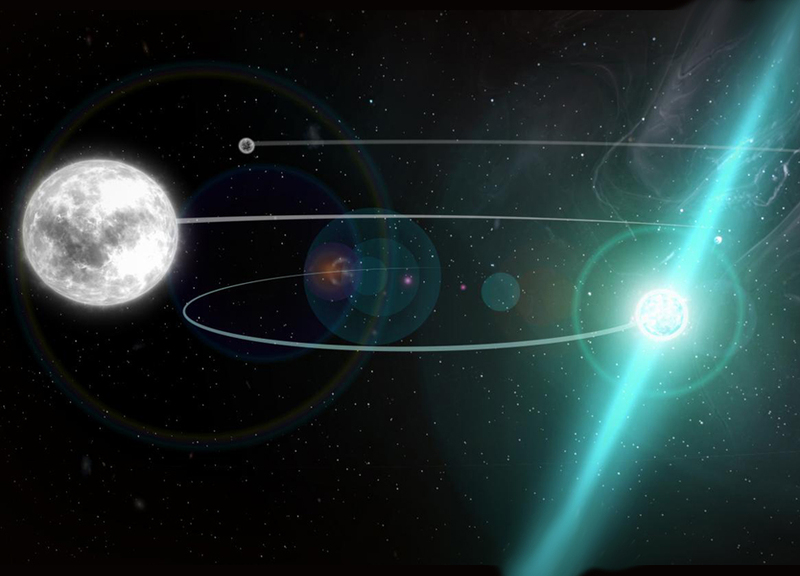 If alternatives to Einstein's picture of gravity were correct, then the neutron star and the inner white dwarf would each fall differently toward the outer white dwarf. "The inner white dwarf is not as massive or compact as the neutron star, and thus has less gravitational binding energy," said Scott Ransom, an astronomer with the National Radio Astronomy Observatory in Charlottesville, Virginia, and co-author on the paper. Through meticulous observations and careful calculations, the team was able to test the system's gravity using the pulses of the neutron star alone. They found that any acceleration difference between the neutron star and inner white dwarf is too small to detect. "If there is a difference, it is no more than three parts in a million," said coauthor Nina Gusinskaia of the University of Amsterdam. This places severe constraints on any alternative theories to general relativity. This result is ten times more precise that the previous best test of gravity, making the evidence for Einstein's Strong Equivalence Principle that much stronger. "We're always looking for better measurements in new places, so our quest to learn about new frontiers in our Universe is going to continue," concluded Ransom. The Green Bank Observatory is a facility of the National Science Foundation operated under a cooperative agreement by Associated Universities, Inc.